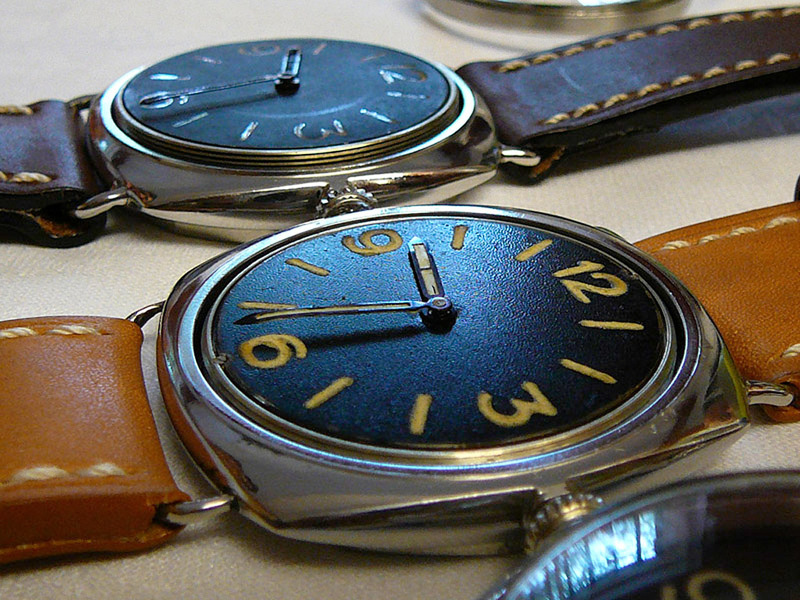 Good news for aficionados of “German” Panerai watches. On September 1, 2018, the German auction house Eppli will be auctioning a never-before-seen Panerai 3646 with sought-after “Kampfschwimmer” (combat swimmer) engravings that comes directly from the family of the original owner. 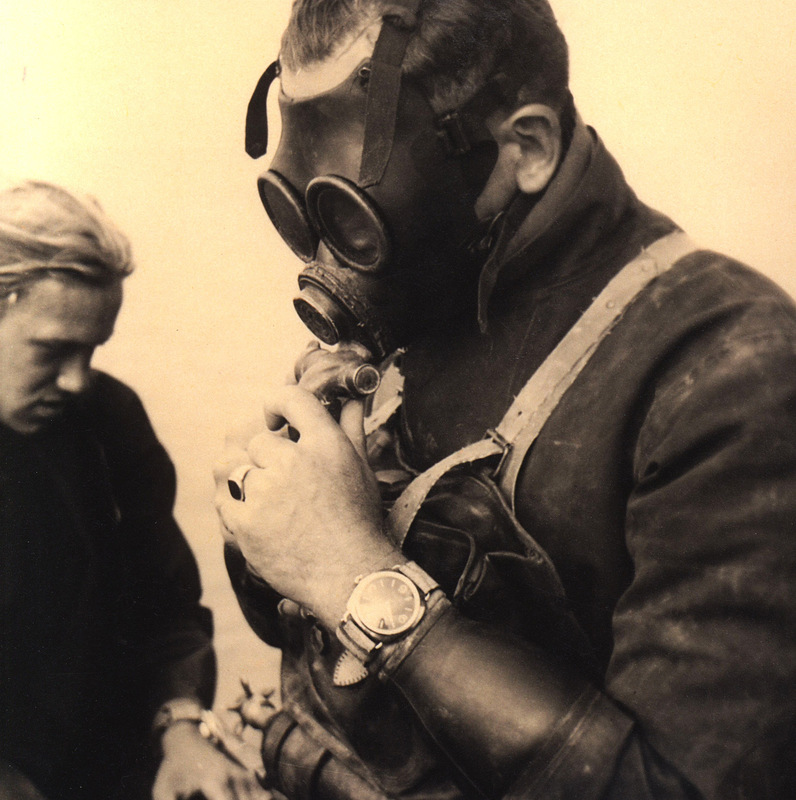 The consignor of the watch is the daughter respectively the widow of Horst Muntau, a German WW2 Kampfschwimmer. Please click the pictures to zoom in. 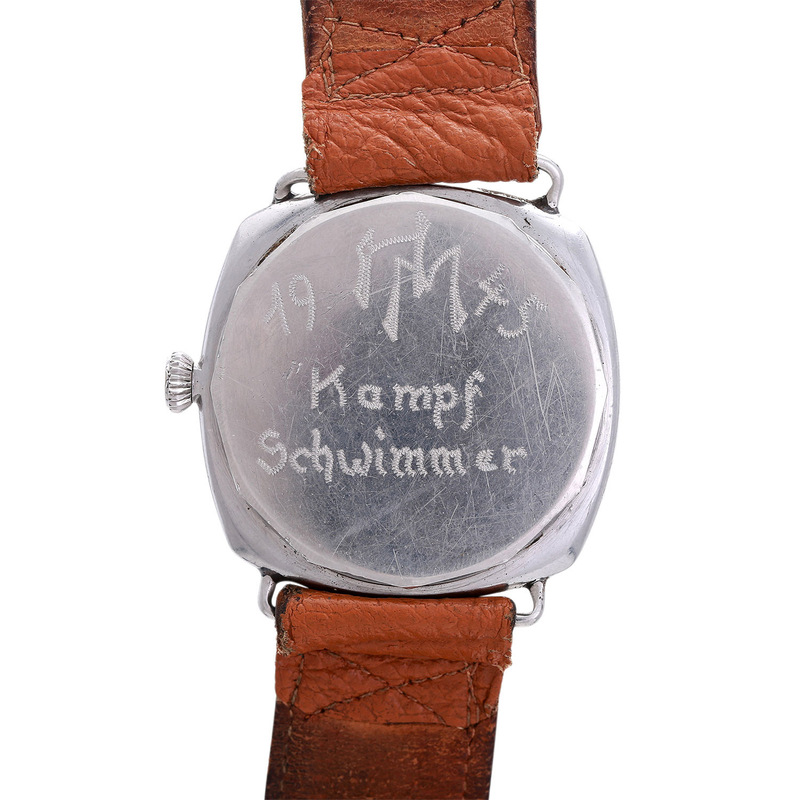 The watch is accompanied by a photo of the young Kampfschwimmer wearing the actual watch during the final days of WW2. 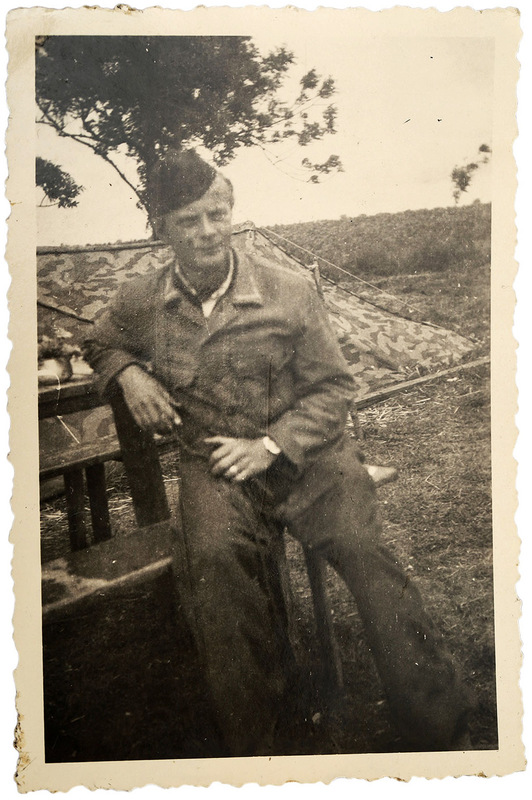 Horst Muntau was a Kriegsmarine sergeant and enrolled as a Kampfschwimmer recruit in January 1945. The war ended five month later in May 1945. Horst Muntau was taken prisoneer by British armed forces on the Island of Sylt in northern Germany. This 3646 comes with a “fuzzy” painted brass dial, a 1 mm thick brass disc with recessed numerals and markers which were filled with large amounts of radium lume in a rather rough manner. Most “German” Panerai watches had “anonymous” dials. The next picture shows details of the “fuzzy” lume. The heat blued hands appear to have been relumed at some point. Painted brass dials were probably made by the Arturo Junghans watch factory in Venice and here is why. 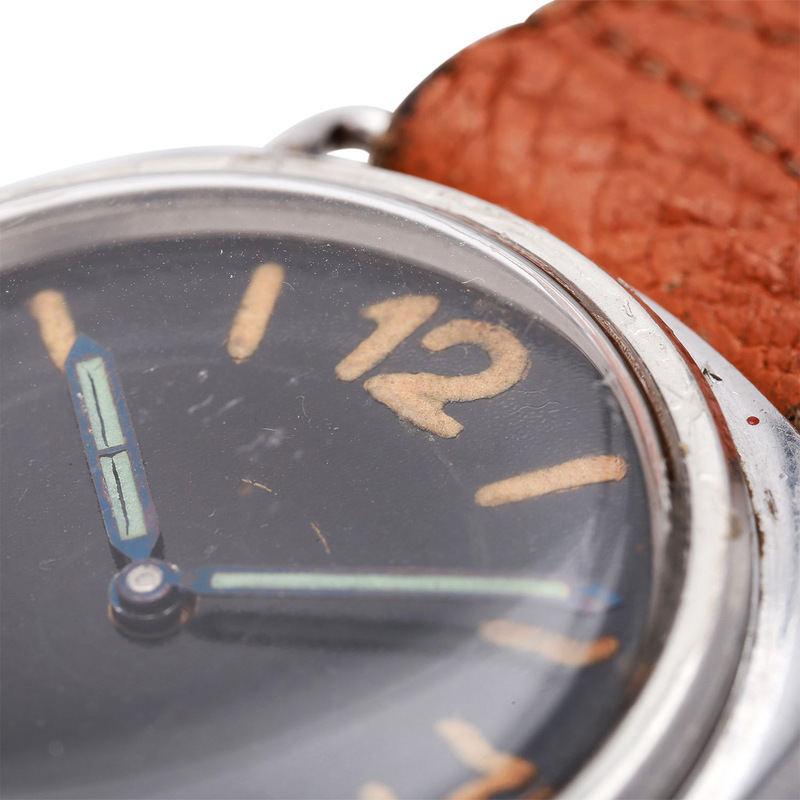 When the Allies reached the outskirts of Florence in July 1944, Nazi forces raided the Panerai workshops and seized all the watches, instruments and machines they could find. The Nazis then retreated behind the heavily fortified Gothic Defensive Line north of Florence. This was Nazi Germany’s last stand in Italy. For practical reasons, the stolen goods from Panerai were shipped to the Arturo Junghans watch factory in Venice. 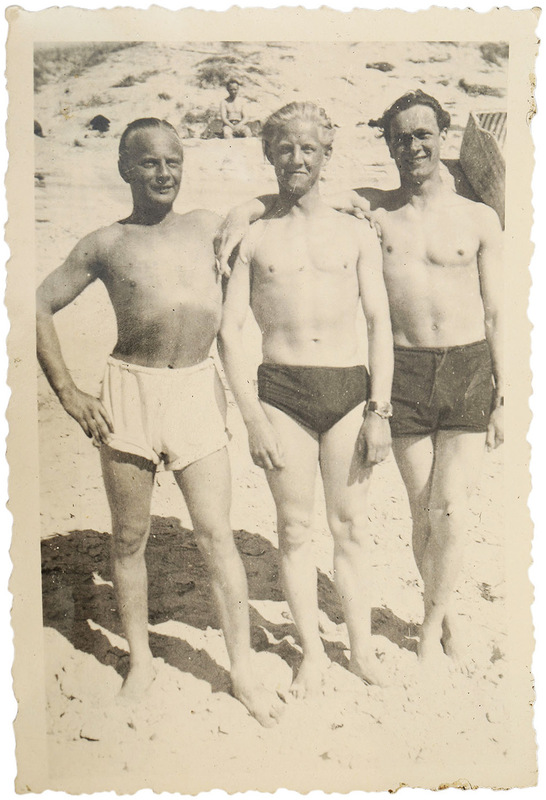 The Kampfschwimmers had a training camp on a small island near Venice, where they were excercising under real life conditions. The watches that arrived to Venice in summer 1944 had so-called “California” dials or Error-proof dials made by Stern Frères for Rolex. Rolex equipped the final batches of Ref. 3646 with their own signature dials on special request of Panerai, who had not been able to produce enough aluminium sandwich dials due to war related aluminium shortage. The “California” dials were probably not satisfactory in terms of luminosity and in consequence, the Arturo Junghans watch factory was instructed to produce a new series of dials to replace the California dials. 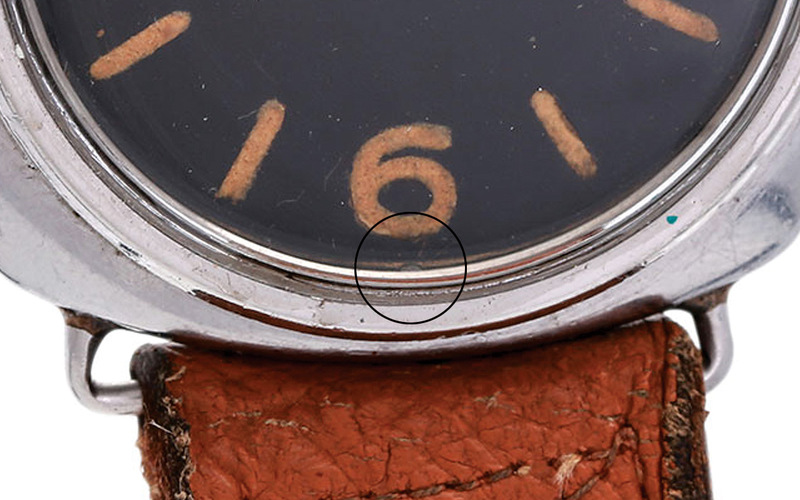 A closer look below the numeral at 6 o’clock reveals that this dial is probably installed with two tiny screws at 12 and 6 o’clock instead of the usual dial feet. Long story short, Rolex probably forgot to tell the dial maker that the dials were meant for wristwatches. Let’s not forget, these watches were a military secret. Since Cal. 618 was a pocket watch movement, Stern Frères soldered the dial feet in pocket watch configuration for a crown position at 12 o’clock. 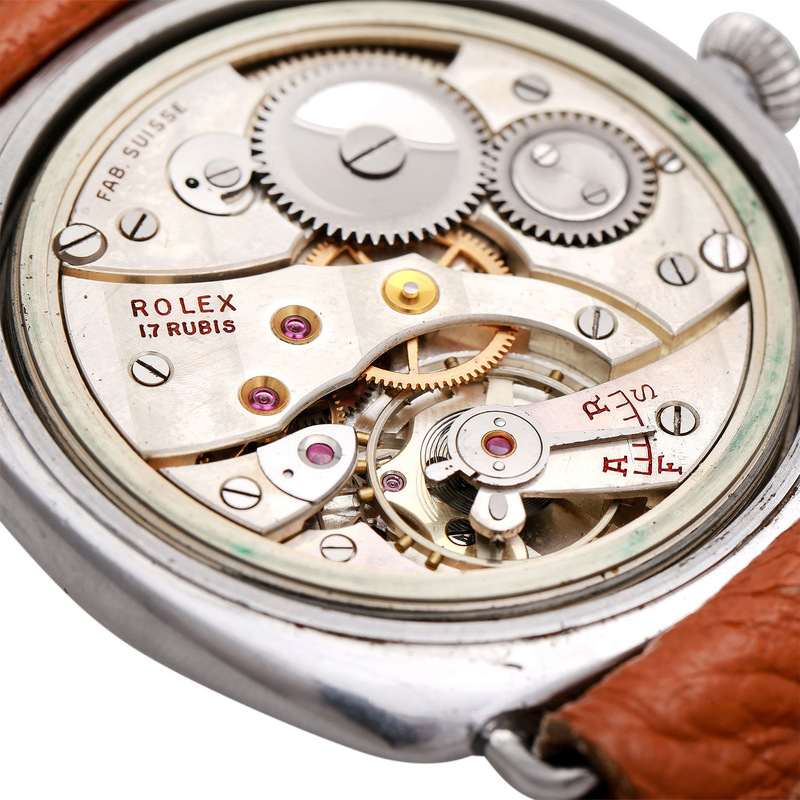 In order to salvage the dials, Rolex removed the dial feet and attached the dials with two tiny screws at 12 and 6 o’clock instead. Here’s an example of such a dial installation. Can you see the tiny screws at 12 and 6 o’clock? The following picture shows a German Kampfschwimmer during his training in Venice. The 3646 on his wrist appears to have a “fuzzy” painted brass dial. From 1940 to 1944, Ref. 3646 was produced in various batches. The last batch from 1944 had the slimmest middle cases. 5.4 mm vs. 6.3 mm. Since no extra space for the thick Panerai sandwich dials was required, Rolex reduced the height of the bezel in addition to reducing the height of the middle case. The result was a “reduced to the max” version of the very first professional diving tool watch in the history of horology. The condition of the case is ok considering its age. It bears signs of wear all over. The wire lugs are unusually bent for some reason. The Brevet screw-down crown No. 11 shows heavy signs of wear and should probably be replaced at some point. 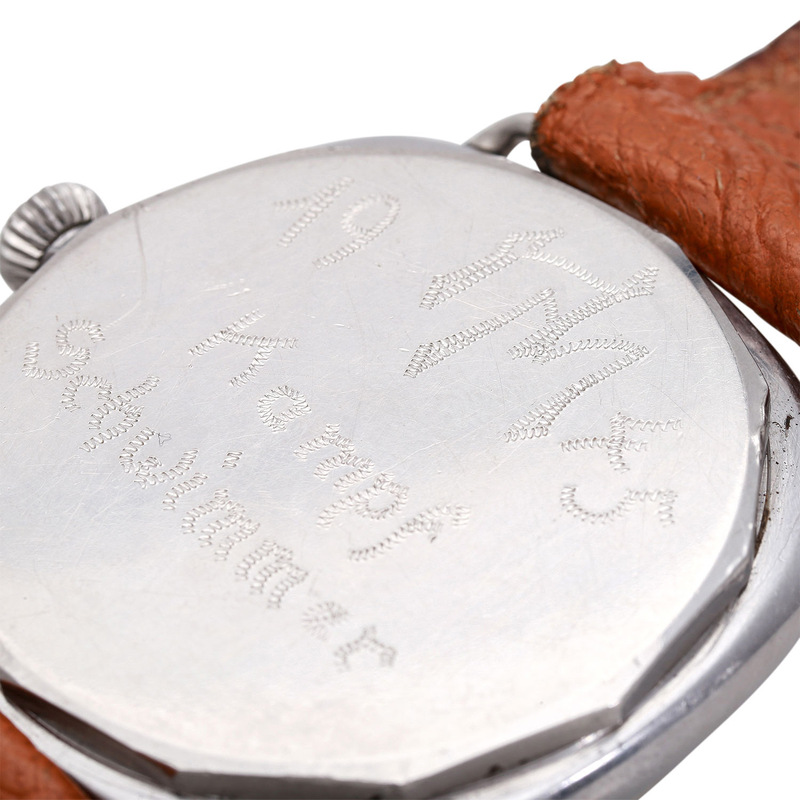 The following picture shows the sought-after “Kampfschwimmer” engravings on the caseback. HM for Horst Muntau. These peculiar engravings were apparently applied using a modified electric shaver during the captivity of the Kampfschwimmers on the island of Sylt. The engravings were made to commemorate having served as a Kampfschwimmer. Ref. 3646 caseback with typical 1944 Rolex hallmarks. 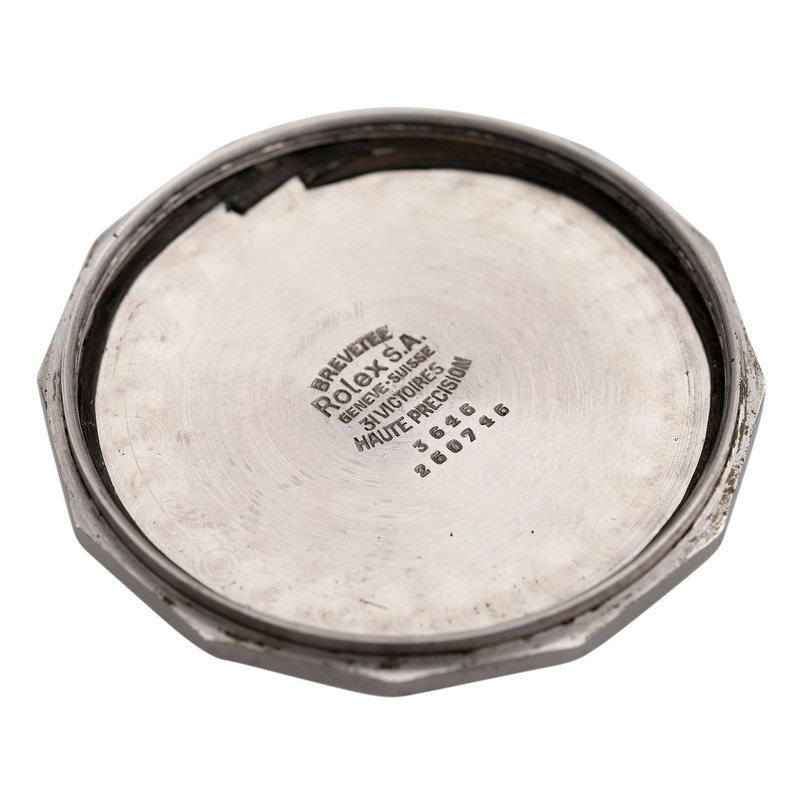 The case number 260746 is stamped underneath the reference number. The photo below shows the Rolex Cal. 618 made by Cortebert. With a serial number in the range of 7,528,000, this movement belongs to the final batch of Cal. 618 made for Ref. 3646 in 1944. A clear indication for this is the different plating compared to earlier movements. In addition, the engravings are slightly bolder than on previous movements and filled with red colour. Ref. 3646 movements are highly elaborated Cortebert 618 calibers. These workhorses come with a fully jewelled escapement wheel (two cap stones) and a Breguet overcoil hairspring. The ratchet and crown wheels are beautifully decorated with a swirl finish. 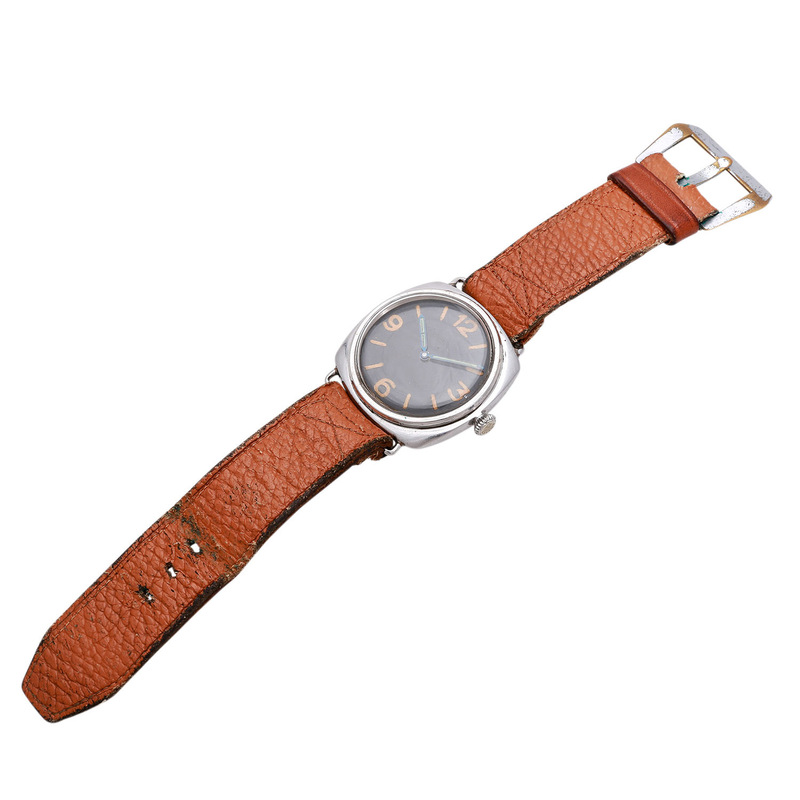 As incredible as it may sound but the strap attached to this watch could be the original strap from 1945, including the original nickel plated brass buckle which is so highly sought-after. I have never seen an original strap in a similarly excellent condition and am still awaiting confirmation on this matter. The buckle was slightly bent for a more ergonomic fitting. To conclude, here’s another shot of Horst Muntau (left) with two other recruits. The guy in the center is clearly wearing another Panerai. 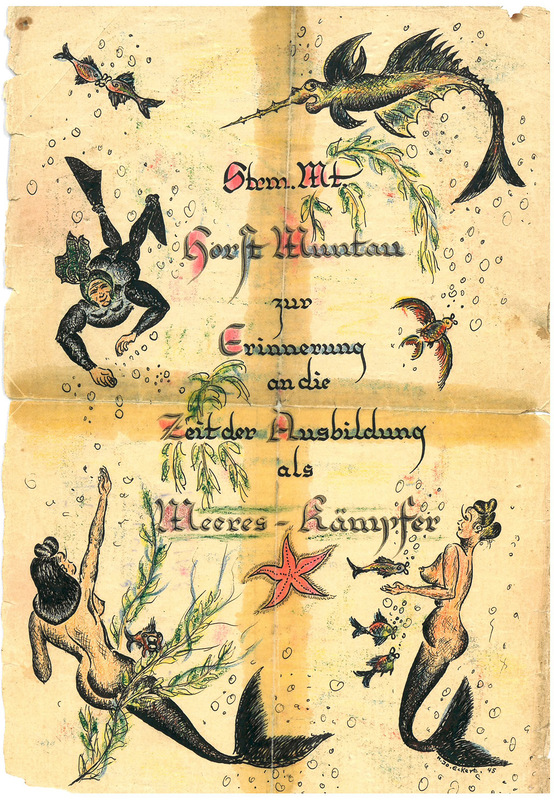 Among many other documents, the set also includes this amazing drawing from 1945 to commemorate Horst Muntau’s combat swimmer training. Before enrolling to the Kampfschwimmer unit, Horst Muntau reached the title of sergeant of the Kriegsmarine. 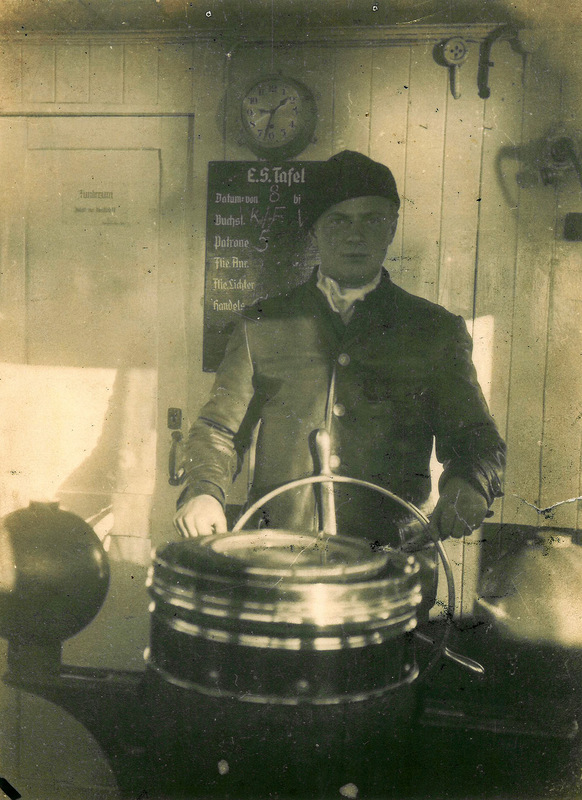 The photo below shows him during his time as helmsman. 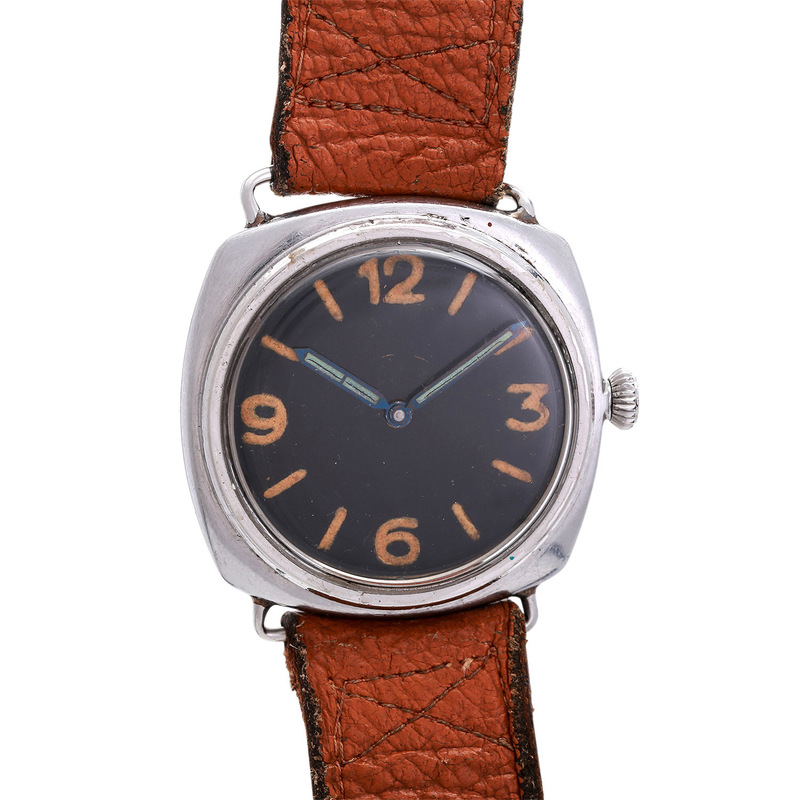 This is not the first time Eppli auctions a Panerai 3646. A watch with very similar characteristics was sold by Eppli in April 2016. 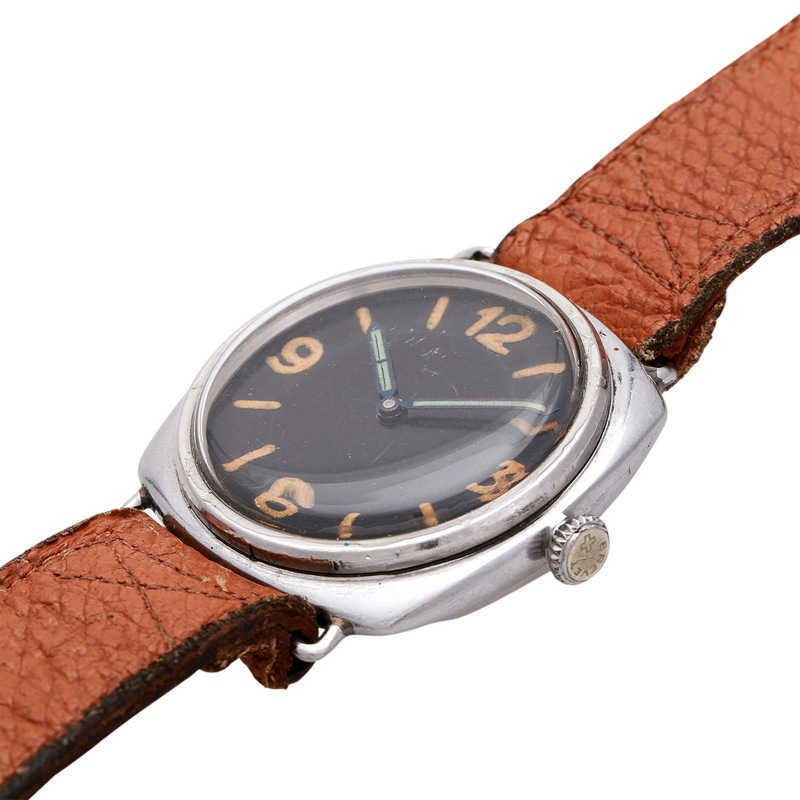 This watch could be a great opportunity for someone lurking for a vintage Panerai with historical engravings. Interest for vintage Panerai is at an all time low at the moment and one could possibly get away with an incredible bargain. The watch itself appears to be almost completely original, except for the relumed hands. It also comes with a great deal of documentation which makes the provenance super water tight. A “Full Set”, so to say. That’s it! Please do not hesitate to comment and share your thoughts at the end of the page. If you have any question please use the comment function to get in touch with me. Comments are only displayed after approval. Make sure you follow me on Instagram. Fresh to the market: An incredibly well documented Rolex Panerai 3646 with sought-after “Kampfschwimmer” engravings, directly from the family of the first owner. Read everything about it now on Perezcope.com. Link in bio. The Rolex Panerai Ref. 3646 with painted brass dial is an important milestone in Panerai’s history. These watches were literally shaped by historical events. 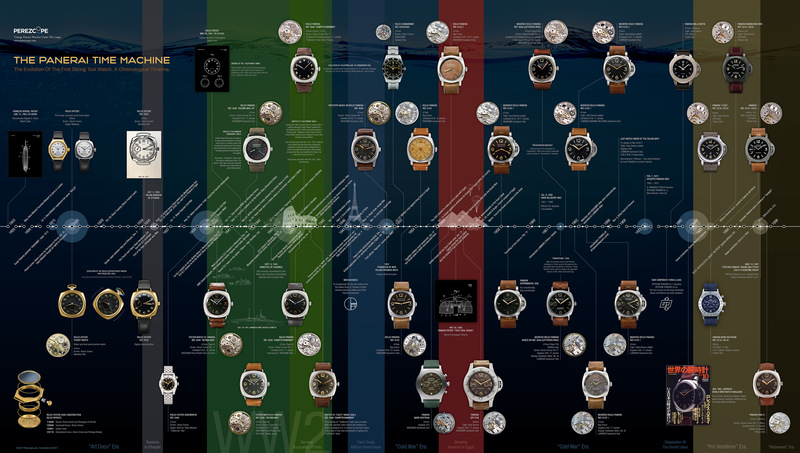 The infographic below shows all vintage Panerai watches in their his historical context. Please click the graphic to download the highres version.